Sixteen of our Bronx students this summer were enrolled at Tennis and Basketball Day-Camp in Riverside Park where they had intense basketball or tennis instruction, on the Hudson. 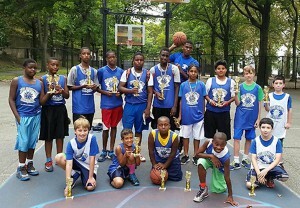 The Kids of Summer, one of the City’s top-quality day camps in connection with the Riverside Park Conservancy provided the instruction and facilities, and also generously discounted the cost. SGHY arranged for transportation and remaining tuition. Our kids came away with new skills, new confidence, new friends and new horizons. I loved the camp!!! The coaches taught me new drills which I now use when playing with my younger cousins. Another game we played was Knock-Out. I showed my friends how to play and now we play it every day at the park. I also increased my stamina and I do not get as tired as I used to. Thank you for having me. I liked this camp because we had excellent professional coaches who trained us. I also liked the outdoor facilities. I was able to work on layups and foul shots and I learned the rules of the game. I also liked the lunches given to us. Thank you for everything. Thank you for the opportunity to go to basketball camp. Even though you have to run and do suicides it was all worth it. When we started to play basketball we practiced our cross-overs and the proper way of playing defense. The camp was a lot of fun. 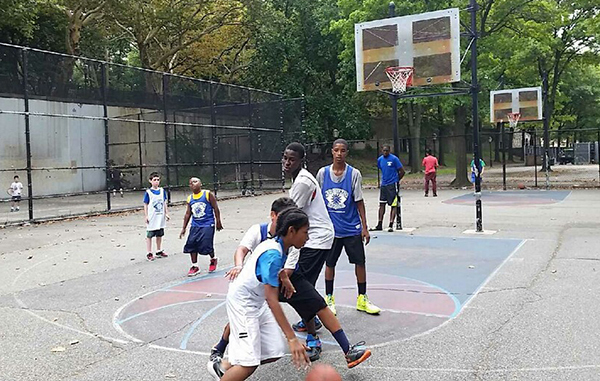 Tagged Basketball, Healthy Youth, Kids of Summer, MS 302, Riverside Park Conservancy, Sophie Gerson, Sports, Tennis.